Do you all know what this is? It’s what some call a flash drive. 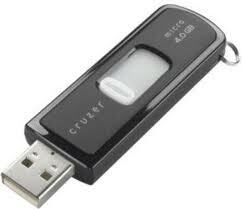 Some call it a thumb drive or a memory stick. It’s something you can plug into your computer, and you can copy files onto it. I have no idea how it works, but I think this tiny piece of metal and plastic holds more information than my brain. It holds the entire Book of Common Prayer, at least half a dozen books, most of the letters and sermons I’ve written in the last ten years, and who knows what else? How does it get in there? I have no idea. But it’s there. And you believe me, don’t you? We’ve learned to accept the miracles of science whether we understand them or not. Christmas is about a somewhat similar miracle. I understand it even less. But what Christmas tells us is that the Almighty God, the creator of heaven and earth, and the galaxies and black holes and quasars and all that stuff that scientists tell us is out there – though we’ve never seen it and some of it is invisible by definition – the creator of all that, who cannot be conceived or imagined or understood, came into this world, this tiny speck of cosmic dust, and into the womb of a young woman and was born as a helpless child: “God in man made manifest” as one of our hymns puts it. That which we cannot see becomes visible. The One we cannot approach becomes approachable. A thousand years earlier, Solomon, king of Israel, built a temple, the greatest building the nation had ever seen, as a place of worship. He furnished it with gold and ivory and bronze, and he dedicated it with elaborate ceremonies, and he said a prayer. He said: “But will God indeed dwell on the earth? Even heaven and the highest heaven cannot contain you, how much less this house that I have built!” Even heaven and the highest heaven cannot contain our God; how much less this child? Now, you know what this is, I’m sure. It’s a wafer. We sometimes call it “communion bread.” Some churches use pita bread or even a regular loaf and break it into small pieces, but it’s the same principle and the same inexplicable miracle: that the God who created heaven and earth comes to us in this bread, is contained in this tiny piece of bread. Most Episcopal Churches have a tabernacle or aumbry, as we do here at All Saints – a special box or container near the altar where they keep some of the consecrated bread and wine to take to the sick and shut ins. Often there are lay eucharistic ministers who take the consecrated bread and wine to those who are shut in. Years ago, a priest I knew was serving as chaplain to an Episcopal school that his son attended and one day his son got into an argument with another boy over whether Jesus was really in that box or not. “I know he is,” said the Chaplain’s son, “My father put him there.” But you know, that is what happens. God puts himself in our hands. We come to the altar and take God in our hands. The priest puts God there and we eat that bread and God comes into our lives to nourish and strengthen, to guard and to guide. “Our God, heaven cannot hold him” but in the bleak midwinter a stable place sufficed. “Our God, heaven cannot hold him but your hands and heart suffice. “Our God, heaven cannot hold him” so how is it possible that my hands and heart could hold my own creator? I don’t know. I can’t explain it. I can’t explain a flash drive either. But God goes out from this service in each of us. “Our God, heaven cannot hold him” nor can this world in which we live but there are places so far from God and so empty there’s room for more. There’s room for more of God’s presence in the debating halls of Congress. There’s room for more of God’s presence where you work and where you live. There’s room for more of God’s presence where the homeless and hopeless look to us for the compassion that we seem unable to bring to bear effectively. There’s room for much more of God’s presence in so many places starting with the place where you live and where I live and that presence depends on us. God needs to go there in us. How could God renew the world through us? It might seem impossible if we didn’t know how little room God requires: a virgin’s womb, a stable creche, a fragment of bread, a human heart. In and though us God still comes to bring peace to a world at war, hope to a world without hope, joy to a world that has all too little reason to rejoice. God comes today as God came on that night in Bethlehem this day, at this altar, in this bread, and most of all, in you.